One of the greatest benefits of using a Tablet PC is the ability to create short videos walking students through lectures or problem-solving exercises. Sure, you can create hand-outs showing step-by-step problem solving, but it’s hard to beat an audio and video combination where you explain each step as you perform it – not quite as good as the live instructor model, but a close second, especially in situations where you have students in your classroom working on different topics, or the student can’t be physically in the classroom! There are a variety of software packages available that allow you to do this, with just as wide a variety of bells, whistles, and prices. These “screen capture” packages record whatever is shown on your screen (or a subset of your screen) along with audio through a microphone input, and output a digital video file in one format or another. Starting at the high end, Techsmith’s Camtasia Studio is the Cadillac of screen capture. Not only does it include just about any bell and whistle you can think of, it also includes an integrated editor that allows you to jazz up your video before publishing to formats ranging from Flash for the web to iPod-compatible videos to Youtube directly. The downside – it lists at $299, with an educational discount down to $179 (and if you do decide to go this route, I’d recommend going the extra mile and purchasing the bundle that includes SnagIt for $199, a screen capture utility that you’ll fall in love with). You can try it out for 30 days for free — its features certainly justify the price if you’re going to use the software extensively, but for just starting out, there are simpler and cheaper options. At the next tier, you can find a wide variety of screen capture software from lesser-known and considerably lower- support firms. 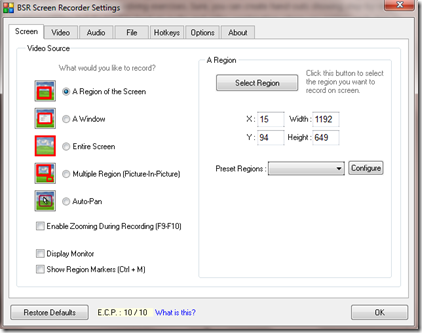 I’ve been using BSR Screen Recorder 4 over the past few years, which was roughly a $30 purchase at the time. The new version, BSR Screen Recorder 5, is available for download for $50, and includes output options to AVI, Flash, and WMV. I can’t speak to the newer version of the software, but BSR4 has performed admirably for me for videos of 10 minutes in length or less. I’ve used this software for everything from movie analysis problems to mini-lectures to flash video creation for the APlusPhysics.com website. In general, the software works fine for its intended purpose, but if you run into trouble, I wouldn’t expect the same level of support you’d get from the higher-end products. Another potential software package for video screen capture is the open-source (i.e. free) CamStudio, based off an earlier version of the now-commercial TechSmith Camtasia package. I haven’t used this myself, but it comes highly recommended from a well-respected colleague who has used it to make quite a number of instructional videos using his tablet pc. 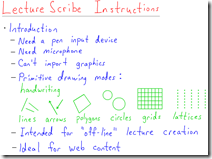 Finally, I’d like to point out a free software package called LectureScribe put together by Brian C. Dean, a computer science professor at Clemson University. LectureScribe is a slick little flash video creation program designed by a teacher for teachers. It takes a bit of getting used to, but if you want a no-frills package to get you started, LectureScribe is your answer! As far as microphones go, you can get away with the built-in mics in many laptops and web cams. Of course, with microphones, you typically get what you pay for. Decent USB microphones can be obtained for $30-$50. 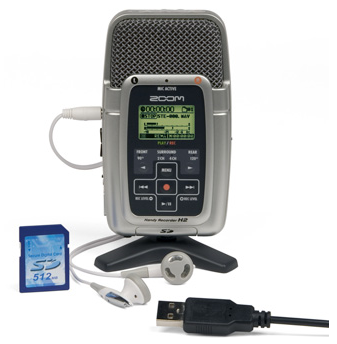 I use a Zoom H2 portable digital recorder ($145 at Amazon), purchased a couple years back as a multi-function device. Students use it in class for our Physics In Action podcast, I use it for creating multimedia videos, and outside of school I’ve used it for recording a reading of books onto CD for my daughter as a Christmas present. It’s a relatively high quality microphone that automatically converts its input into digital files, so it’s very portable, or you can plug it directly into a computer for use as a microphone. For simple video recordings, however, this is probably overkill. The easiest way I’ve found to create these videos is to place the problem in Bluebeam PDF Revu before starting the recording. Then, set up your microphone and screen capture software to record the Bluebeam window. Next, solve the problem just as you would in your class, explaining your steps as you go. Finally, hit the “stop record” button in your software, and save your video file to a format that best meets your needs! This entry was posted in Tablet PC and tagged APlusPhysics, Bluebeam PDF Revu, BSR Screen Recorder, Camtasia Studio, Lecture Scribe, Physics In Action, SnagIt, tablet, tablet PC, TechSmith, Zoom H2 by admin. Bookmark the permalink. Wow. I just started experimenting with screencasting last weekend, and had been frustrated by the trade-offs imposed by the software I was using for annotation. I’ve just tried Bluebeam Revu and I don’t remember the last time a piece of software was so well-designed that it left me with my jaw dropped. 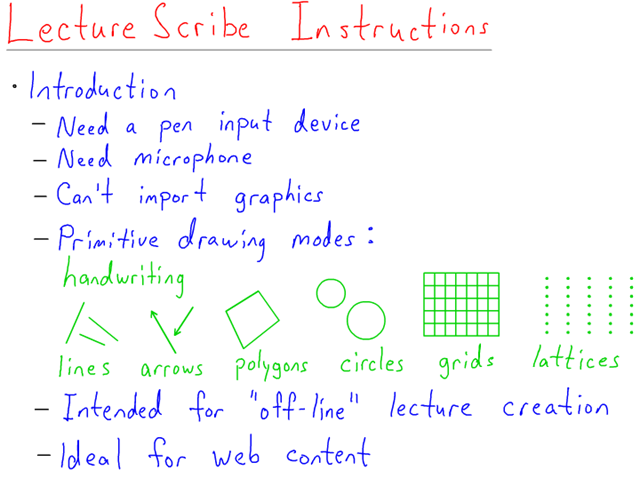 From Office integration to the inclusion of subscripts to the automated handwriting recognition, every feature I went looking for existed — and it was right where I expected to find it. Thanks so much for the thorough reviews. I’m glad you found Bluebeam PDF Revu as helpful as I have… good luck with the screencasting, I’m enjoying following along with your impressions and learnings, as the next two items on my project list (not sure which comes first yet) are either creating screencasts for the year-long introductory physics course I teach, or creating a written study guide (mini-book) based on the curriculum. After reading your impressions, and recalling all the planning that went into screencasts, perhaps I’d be best off going topic-by-topic and screencasting / creating the study guide in parallel. Can’t wait to read your next blog post on student impressions and what you find makes your screencasting more and less effective! Nice succinct post on making instructional videos. I started making these 4-5 years ago and it was a hard thing to do in those days. Now I do it by contract for major book publishers (and still do it for my classes.) This week alone I’ll bang out 20 15-20 minute videos – solving very complex problems that can involved up to 6 steps. Today, it’s actually easy and everyone should at least have it among their tools. I say it is easy because it is – if you can teach, you can teach on graphic form one way or another. But it takes some practice – and it is important to be clear, practice is not the same thing as it being hard. Just start. I would strongly suggest the money be invested in Camtasia (but also use Jing, for free.) Screencasting is now a serious necessary instructional technique – you have purchased a computer, invest in some professional software and Camtasia is that software. I use it only for editing and for lecture capture, Jing does the screencasting. For my best work, I do it differently than using a tablet PC or Watcom tablet – I use a pad of paper and a video camera. When in a hurry I do use the tablet but my handwriting and legibility is MUCH better on paper. I can easily flip back and forth to my computer screen with Jing and it turns out a very nice product. For an example, see: http://www.youtube.com/watch?v=49k88Alfh88 Nice post! Thanks Rick — I had a similar experience, starting with instructional videos in 2002/2003 in developing an online course for a local university… actually had to head to their studio in the basement of the library to record all the videos, and they had a full-time technician assigned to handle the more difficult aspects. Now it can be done simply right from the home or office, and with 10% of the equipment required just a few years ago. Regardless of the technology, I think without a doubt the most important aspect of screencasting is advance planning… identify your intended audience clearly, assess what they already know, define your learning objectives, then teach to those objectives, and assess again. The same basic teaching principles that have defined good teachers for decades still apply with a new electronic medium. very interesting comment. Not sure you will get an update but I was wondering what you are using for screencasting 2 years later. What recommendation do you have? Hi Leo — you’re right, this is due for an update. I’ll see if I can’t dive into it later this afternoon. Another free option is Debut which offers a free and a paid version. I prefer this over CamStudio because you have a few more output options and some other bells and whistles. Reading all comments, camatasia seems to be a great option. But there are so many tablet PCs in the market, which one will be the best to be used with camatasia…plz name a few! By tablet PC I mean a laptop computer you can “write” on… some popular ones of higher quality include the Lenovo x201T / x220T line, and Fujitsu and Toshiba also make popular business-quality lines. Another option is to use something like a Wacom Bamboo or inTuos pad — I find my handwriting on those isn’t nearly as near or organized as the writing directly on the screen of a tablet PC, but they can also be made to work (and usually at a significant savings compared to an entire tablet PC). Good luck! Thanks man. One more thing. For Camatasia, a Windows tablet PC will be needed, android will not do. As I think Camatasia needs Windows. Some people say that Windows tablet PCs are not as good as Android. I think you misunderstand my meaning for the term “Tablet PC.” Please see my above response or the first paragraphs of the beginning article in this series http://aplusphysics.com/flux/tablet-pc/tablet-pcs-in-the-classroom/ for review. “Tablet computers” such as iPads, Android systems, Samsung Galaxy, etc., are not what we’re talking about here. By tablet PC I am referring to laptop computers which run Windows AND have the ability to flip the screen around so you can write on the screen with a special stylus. Examples of systems which allow you to do so are given in the previous response. Hope this helps! Ok…got it. Then how good are these “tablet Computers” like ipads, samsung tab for video making with Camtasia? Most of these tablets won’t run Camtasia. There are other software packages you can use to make screencasts with them. Check out the “Flipped Teaching Network” (http://vodcasting.ning.com/) for more info. Do you do something to get perfect voice….i mean clear from all noise. I tried a lot of stuff including noise filtering in Camtasia…not yet getting perfectly clean voice as in your videos. It’s all about the microphone as far as sound quality goes. There are a couple of good, cheap USB microphones ($50-ish) that will work well. Trying to use an internal mic is typically problematic. Hi….I have been using bamboo. But I find that my handwriting with it is not so good so I am planning to buy wacom cintiq 12. As per my understanding, cintiq will as good as tablet PC or may be even better in terms of annotating on screen directly. What’s your take on that? Also I am struggling with annotation software. Evernote draws very smooth curved lines but it does not seen to have much feature for free-hand drawing. When I use most other softwares, I get step like fragments in a curved like. What’s the solution to this? If you can afford it, the Wacom Cintiq 12 should be a great solution. Like you, my handwriting isn’t so good with the Wacom tablets, which is why I prefer the tablet PC or something like a Wacom Cintiq. I wouldn’t recommend Evernote for the annotation software. Best thing I’ve found is Bluebeam PDF Revu for Windows (Mac version late this year), and Curio for Mac. Well done Dan, by finding these pieces of software, especially the free ones. Another piece of software which I use in my physics and math classes with my now-old HP Tx2 (which has managed to survive the kill-screen bug so far), my newer Dell Inspiron Duo (a headache for its capacitive screen although a Jot Pro stylus helps a bit), and now a institution supplied Dell Latitude ST and XT3, is the stand-alone Classroom Presenter from U of Washington (classroompresenter.cs.washington.edu), and its web server sibbling Ubiquitous Presenter. For CP I use a Warpia wireless USB adapter to move around the classroom. I can prepare PPTs with open spaces to write on my class notes, which are later saved for later view by students or can be captured in class. BTW even though this blog does not deal with Android tablets, there is some nice presenter free software I have use with a cheap MID tablet, Whiteboard by Greengar. I use Mirrorop to project from the tablet to my classroom Tablet pc(the Tx2) which uses the Warpia. A fun use of a Tablet PC to allow a tablet to project my class notes in real time. Who knew a tablet will need a Tablet PC to do a class (in physics). Dan, you and all readers are invited check my not-so-often-written blog on my experiences with tablet pcs and tablets, including a re-use of another Tx2 for class (the original died on bug screen failure – a well documented chip manufacturing mistake HP and AMD never recognized), is at tabletsinscienceeducation.wordpress.com.